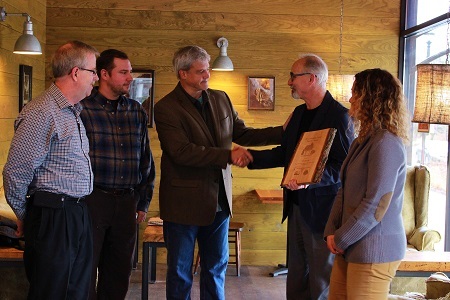 In December, I was honored to help present Tom Kubula and Gerard Capell with the Wisconsin Urban Forestry Council’s Innovations in Urban Forestry Award. This award was given to Tom and Gerard for their role in developing the first urban wood specification based on their installation of urban ash wood in the new Mequon Colectivo Coffee. 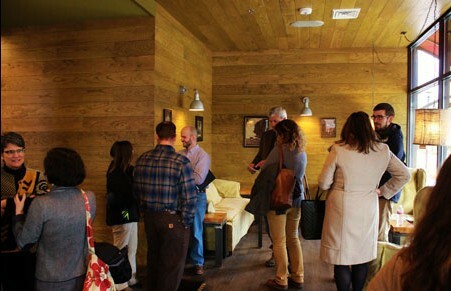 The specification outlines how urban wood is cut, dried, and structurally labeled, with the hope that more architects will have confidence specifying urban wood in commercial or industrial projects. We had a small group gather to celebrate but the caliber of people there, all with the passion for giving urban trees a second life, was inspiring. Architects, academics, government, non-profit, environmentalists and waste experts all worked together to make this and many more projects possible.